The new book by UCSC lecturer Ryan Coonerty. SANTA CRUZ, CA--Anyone who has ever gotten goose bumps visiting the Lincoln Memorial will be drawn to the new book Etched in Stone: Enduring Words from Our Nation's Monuments. Author Ryan Coonerty, a lecturer in legal studies at the University of California, Santa Cruz, calls attention to the words and phrases that adorn 50 monuments across the country. Etched in Stone (Washington, D.C.: National Geographic, 2007) takes a broad view of monuments, encompassing tributes to public figures and ordinary heroes, as well as to events that must not be forgotten and ideals such as the promise of freedom. "Part of what I wanted to do with this book is provide an accessible history of our country," said Coonerty, who is also vice president of Bookshop Santa Cruz. The bookstore will celebrate the publication of Etched in Stone with a public reception on Wednesday, March 28, at 7:30 p.m. Included in the collection are familiar landmarks like the Thomas Jefferson Memorial and the Vietnam Veterans Memorial, as well as lesser-known works such as the Slavery Monument in Savannah, Georgia, the Salem Village Witchcraft Victims' Memorial, and the Clayton Jackson McGhie Memorial in Duluth, Minnesota, a tribute to the victims of a lynching in 1920. "I identified historical moments and people, and then looked for words etched in stone," said Coonerty. "I started with wars and social movements. At times, it was difficult because I don't think our monuments look like our country yet, in terms of racial and gender diversity." Coonerty was inspired to create the book five years ago while living in Washington, D.C. "I was struck by the importance of the words that are etched in stone, and I started seeing them everywhere," he said. Traveling to other cities, Coonerty eventually compiled a list of nearly 125 eligible sites. 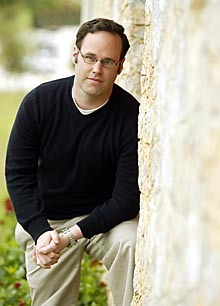 "One of the joys of writing this book was discovering these new sites," he said. Coonerty included the Native American petroglyphs of Newspaper Rock State Historic Monument in Utah in the book. "I found sites all around the country, but people were obviously here before the country was," he explained. "The idea of engraving words and images into stone dates back tens of thousands of years." The World Trade Center Memorial is a work-in-progress that demonstrates the controversy and emotion that can accompany construction of a monument, noted Coonerty, describing the ongoing debate over the presentation of victims' names. "Memorials today are being built shortly after the event," he said. "The Vietnam Memorial was built 20 years after the war, but with 9/11, the planning began right after the tragedy--the day after." Memorials are built to convey the feelings and emotions of the time, and they provide an outlet for grief, but they "have to last centuries, so they need a context," noted Coonerty. The Washington, D.C., memorial to Franklin D. Roosevelt was designed 50 years after his presidency and offers a "different take" on his presidency than would've been possible immediately after his death, added Coonerty. Although the National Mall in the nation's capital represents the most coveted acreage for memorials and monuments, Coonerty said Grauman's Chinese Theatre in Hollywood--the last entry in Etched in Stone--has a special place in the hearts of many. The sidewalk where dozens of movie stars have left their handprints and footprints in cement draws more than two million visitors each year. "It definitely deserves to be in the book," said Coonerty. Etched in Stone also includes a public-art project in Portland, Oregon, called Streetwise but known informally as the Talking Sidewalk. The brick walkway incorporates stones engraved with quirky quotations from the likes of Groucho Marx, Marilyn Monroe, and Albert Einstein. Set at odd angles to catch the attention of pedestrians, the engraved bricks evoke laughter and brief but uplifting interactions among the city's bustling crowds. "For me, monuments are also about our public spaces, places where people can come together," said Coonerty. "The world is so disconnected today. We need places where we can come together in celebration or mourning." The sites profiled in this chapter--memorializing the worst injustices and tragedies in the nation's history--attempt the nearly impossible task of providing meaning for acts that were often meaningless. By their nature these spaces must be a place for the living and the dead, a place of reconciliation for justice delayed and justice denied--a public space for private grief. These sites must be relevant when those who knew the victims have long since passed and their lives and loss are assigned to a few words inscribed on a wall, a bench, or a pedestal. 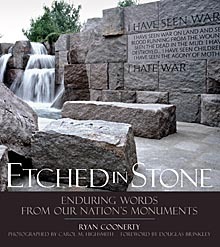 With a foreword by historian Douglas Brinkley, Etched in Stone also features the work of noted architectural photographer Carol Highsmith, as well as historical photographs from the Vietnam War, the civil rights movement, and other eras. Coonerty, who still works behind the register at his family's legendary independent bookstore in downtown Santa Cruz, said it's exciting to be a first-time author. "I grew up in a family where books and words are of the highest importance, so to be a part of that is fantastic," he said. A high-resolution photo of the cover of Etched in Stone is available for download.